The ED seed drill from Davimac Engineering ensures a consistent seed placement, a reduced soil disturbance and a precise seeding depth. 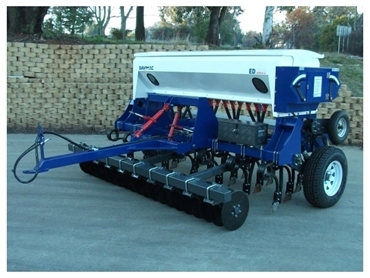 The seed drill has a simple robust design and is easy to operate. The drill is also powder coated which gives a long lasting finish and a protection from corrosion. The heavy construction seed drills feature 25mm coil tines which are fitted with baker boots. This gives a great seed to soil contact and optimal germination rates. Optional disc coulters can be fitted to the seed drill. The disc is 400mm and heavier than the industry standard which improves durability and strength. These discs last twice as long as the 360mm discs which cuts down costs.